This year’s conference is dedicated to Ilias Tantalides. Ilias Tantalides (1818-1876) was a Greek poet, philologue and renowned professor of letters of the 19th century. He was born in 1818 at the Phanar in Constantinople (Istanbul). He studied at the Great School of the Peoples in Halki and then at the Xerokrini School. He completed his studies at the then nascent Evangelical School of Smyrna (Izmir). He returned to Constantinople and was taken under the aegis of the renowned philologue and physician Stephanos Karatheodoris as private teacher of his children, whom he taught for six years. In 1840, Tantalides travelled to Athens to deepen his knowledge, by studying higher Mathematics at the newly founded University of Athens. He also followed, for a period of three years, philosophy and philology. He returned to Constantinople and inaugurated an ecclesiastic journal which did not come to publication fruition, mainly due to his unfortunate submission to eye disease in 1845 and eventual blindness. In 1846, he was elevated to the position of Professor of Hellenic Letters at the Theological Seminary of Halki, a position he held for 30 years until his passing in 1876 at an age of 58 years consequent to acute peritonitis. During his tenure at the Theological Seminary he produced many works on issues relevant to his day and of interest to the Ecumenical Patriarchate (Papal Criticisms, The Schism and Patriarch Cyril the II, Letters and communications to and with India and many others). From a young age, Tantalides was especially fond of poetry. In Smyrna, still a student of 10 years of age, he published his first works "Ode to May". At 20 years of age he published "Play" and received acclaim and distinction among the most well known poets of Greece. His third poetic works "Personal Verses" was published in 1860 in Trieste, Austria. Tantalides was also influential in matters of a diplomatic nature as he served the role of adviser to the Greek Patriarchates. Tantalides was perhaps the last of the Great Phanariote men of Letters and writers and intellectuals. 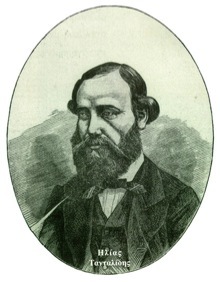 He passed on much of his knowledge to his renowned student George Vyizinos who, as a consequence of Tantalides' influence, changed his plans to serve the church as a clergyman and instead shifted his focus to Letters and studies in Europe where he would later become one of the most distinguished men of Letters of Greek descent. • Παίγνια · ή Ποιήματα Διάφορα. Σμύρνη, τυπ. 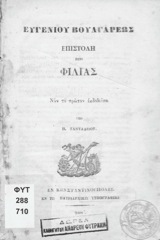 Ηώς, 1839. • Ιδιωτικά στιχουργήματα. Τεργέστη, τυπ. 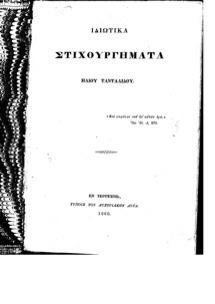 Λοϋδ, 1860. • Άσματα μετά μουσικής (παιδικά τραγούδια). 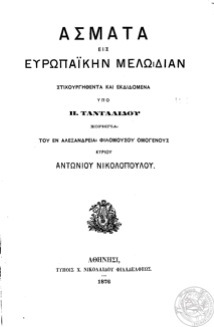 Αθήνα, 1876. • Ποιήματα· Μετά προλόγου υπό Ιω.Ζερβού. Αθήνα, Φέξης, 1916. • Άσματα πολεμιστήρια. Ύδρα, 1927.